What is the different between Safe Sender and Blocked Sender? A safe sender is a contact who you consider safe to receive emails from that contain attachments (images, documents, etc.). Emails from these contacts will never be treated as junk email. At the top of the screen, select Settings  > Mail. 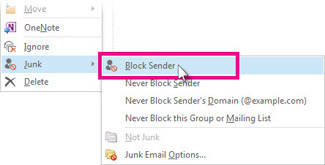 A blocked sender is an email address that is treated as junk email. Emails from blocked senders follow the same rules as your Junk Mail. Messages from Blocked Senders are sent to your Junk Mail folder or deleted, depending on the Junk mail rules.